Finally: The X-Men! It's been nearly two years since Stan & Jack gave the world the first issue of The Fantastic Four, and unwittingly began the process of bringing the Marvel Universe to life. And though the FF's early success quickly gave way to other new creations - the Hulk, Spider-Man, Thor, and the rest - this is the first time since that the pair have created a super-team of all-new heroes, as they did then. Not that they've been avoiding new team books; after all, just a few months back they gave us Sgt. Fury and his Howling Commandos (new characters, but not supers), and the same week this issue appeared on the stands would also see the debut of another brand-new team book from Lee & Kirby (though one collecting preexisting characters). But as far as an all-new super-team comprised of all-new characters? Definitely the first time Stan & Jack have done so since FF #1 ... and, unless I've missed something obvious, also their last. All these powers at his command, and what does he do? Have them move his chair. Nice one, Prof. Real nice. When speaking of how he came up with the idea for mutants in the Marvel Universe, Stan Lee has famously cited the idea as an incredibly appealing, and proudly lazy, shortcut. After all, every time the Fantastic Four or Thor faced a new menace, Stan had to spend time thinking up how this new character had received his powers. With the idea of an evolutionary offshoot from mankind, however, we could explain it away with a single line: "They were born that way." Problem solved! 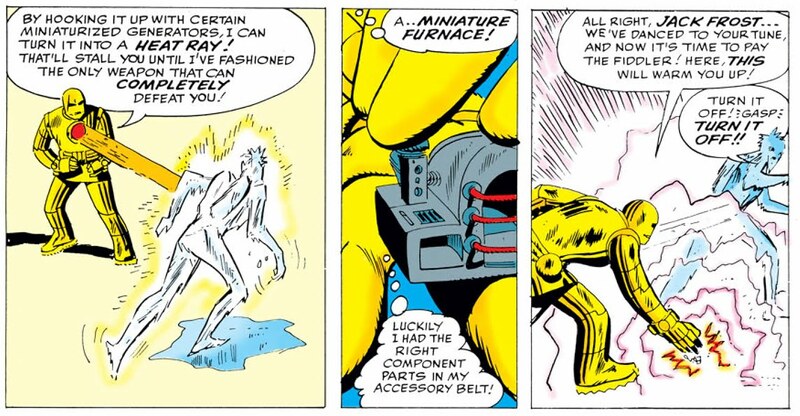 Of course, as with all these early Marvel creations, the idea of mutants doesn't immediately jibe with how they would later be perceived; for instance, Jean says that she's dealt with her power all her life, but this clashes not only with the origin she will eventually tell us, but also with the later idea that mutancy almost always manifests itself at puberty. And there's as of yet the barest hint of the mutant/racism metaphor - the idea that mutants are distrusted because we fear what is unlike - although this would come to be the predominant theme of X-Men comics for years to come. the adventures of Bobby the Snowman. As with FF #1, it's interesting to see the various ways in which these early versions are "off-model" from the characters we know today; for instance, Iceman is the most obvious case, having a body seemingly composed of snow instead of ice. (Was this to differentiate him from Jack Frost, the villain who just debuted the month before?) But subtle differences can be seen in all the others too: For instance, Hank McCoy (The Beast) hasn't yet been conceived as the super-smart member of the group who peppers his speech with ten-dollar words; in fact, a survey of his dialogue in this issue suggests that Stan initially saw him as another typical "bruiser", in the vein of Ben Grimm or "Happy" Hogan. 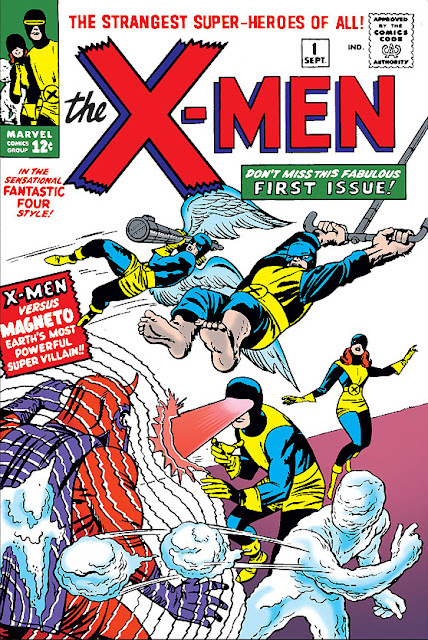 In many ways, these early X-Men are very different from what they would later evolve to, and long before the property became a blockbuster, it always struggled - in fact, by decade's end, being effectively cancelled due to low sales. Do you think Stan felt this way about X-Men #1 hitting the stands? An interesting controversy from this period revolves around the similarity of The X-Men to DC Comics' The Doom Patrol. As one reviewer points out, "they debuted within months of each other, they’re both teams of super-freaks who just want to be loved and accepted, led by a man in a wheelchair, and they both fight Brotherhoods of Evil." Was this similarity just a coincidence, as Brian Cronin suggests in his book Was Superman a Spy? Or was it an intentional rip-off, as alleged by Doom Patrol creator Arnold Drake? (Then again, as the writer who came up with the version that didn't become a globally-renowned franchise, his perceptions might be understandably biased.) My own suspicion is that Stan was far too busy creating all these new characters and titles to be too involved in idle gossip about what they were working on across the street ... and besides which, why intentionally copy a wholly untested property, one which might be just another failure? 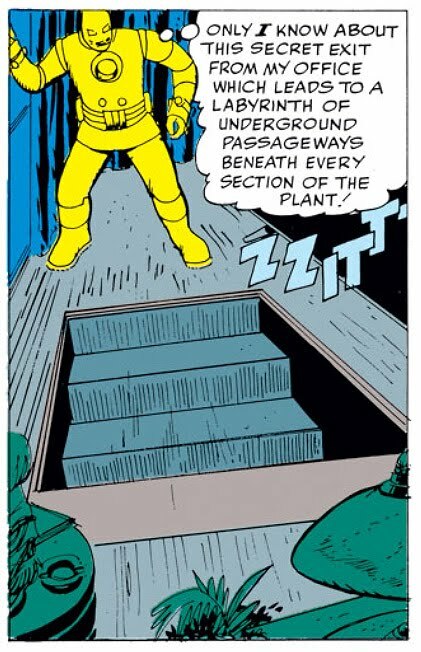 (As indicated, The Doom Patrol never really set the sales charts alight, and The X-Men wouldn't start to achieve any real success until the 1980s.) As bizarre as it seems, it may just be another example of the strange phenomena where an idea is "in the air" and strikes multiple creators at the same time - such as Marvel's Man-Thing and DC's Swamp Thing both debuting in the 1970s, or two competely different asteroid movies hitting theaters in the summer of 1998. Don't get used to this welcome reception, guys! "Let's see... Keys: Check. Wallet: Check. Anything else? Guess I'm good to go!" First up: Harry "Happy" Hogan. When Stark enters himself as a race car driver in the 500-Mile Speedway Classic (an event lifted for the 2010 film), his car goes out of control. 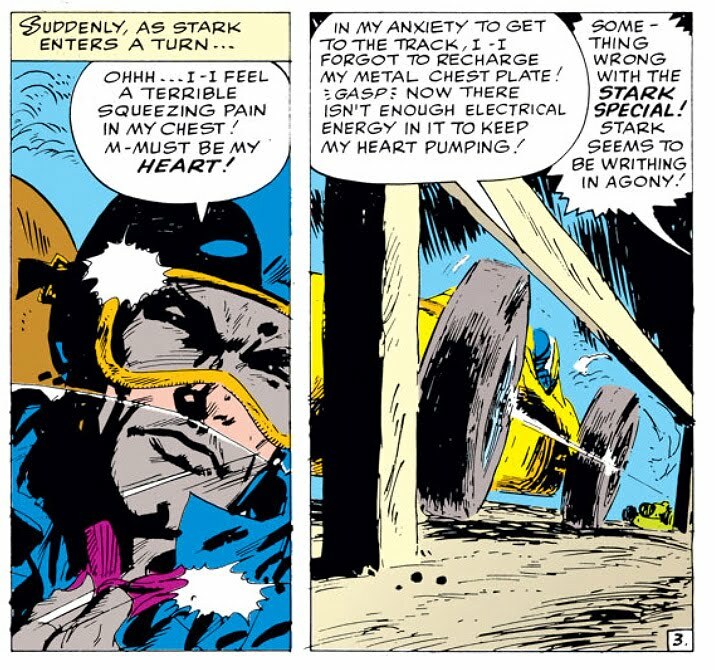 Seeing the accident from the sidelines, Hogan pulls Tony from the flaming wreck, and then drives him to a motel where Stark can recharge his metal chest plate. And with that, Happy has earned himself a job as Stark's chauffeur and bodyguard! Odd note though: As presented here, Happy seems in appearance almost a thug, and his name is one of those ironic misnomers: "Happy" because he never smiles, you see. This wouldn't last, however, and Happy would soon come to be known for his steadfast, genial nature. Ignoring the ham-fisted dialogue, doesn't Pepper seem rather dowdy? Oh, man! I totally want a secret underground labyrinth!! Seriously. I'm not joking here. Make it happen. Finally, the villain for this piece is one Jack Frost, who is an interesting example of a neat idea almost immediately abandoned. Sullen scientist Professor Shapanka is obsessed with immortality, and specifically the use of cryogenics to preserve someone forever. However, wishing to avoid the downside of being asleep in a block of ice - what use is immortality if you're not around to enjoy it? - he instead creates a suit to simulate the effect while staying awake and about. 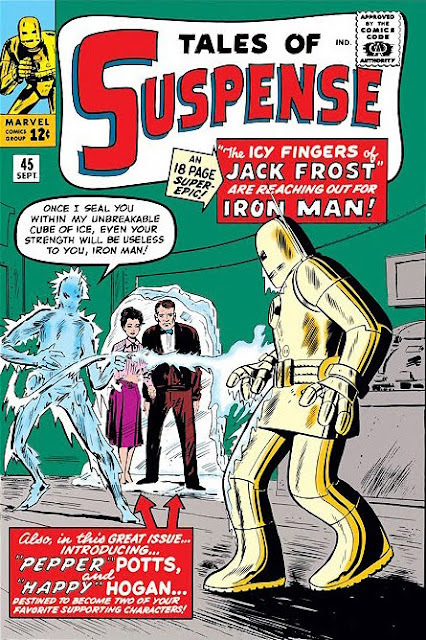 This is all well and good, and a pretty compelling origin for a villain ... but once he's created the suit, the whole motivation goes out the window, and he starts using his ice powers to freeze everything in sight, rob banks, etc. In other words, he's just become yet another boring, costumed criminal, and the immortality angle is never mentioned again. Uh. Yeah. Sure is "lucky"...! And here we have Strange Tales Annual #2, the first annual featuring Marvel's Silver Age superheroes, and one of their earliest annuals to boot. The average comic book has traditionally come out once a month - twelve times a year - and is a 32 page package, 22-25 of which are story pages or other editorial content (like letter columns or house ads). By contrast, a comic book annual would come out once a year and often be much, much larger, as in the 72-page giant seen here. Marvel had just started started experimenting with annuals the previous year, Strange Tales Annual #1 (reprinting thirteen of Marvel's monster and sci-fi short stories of the time) and Millie the Model Annual #1 (containing a mix of short stories and other features) being their first. This year, the Strange Tales Annual also featured reprints of ten short stories ... but opens with an 18-page, all-new tale featuring Spider-Man and the Human Torch! of this joke. Hey - it's a good one! 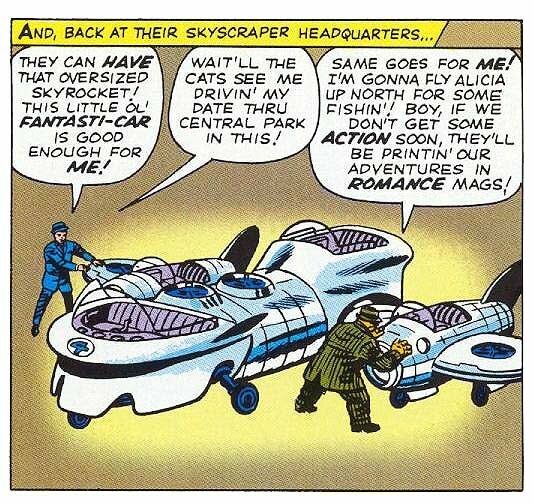 An additional treat is that this story is pencilled by Jack Kirby, with inking by Steve Ditko! While I was mostly mystified by their pairing the first time I came across it, later efforts impressed me - and this is no exception. Even beyond commemorating such an issue by having the feature story drawn by Marvel's two main power artists, it's also appropriate "casting". After all, Kirby started Johnny's solo adventures, and still (at this time) draws Johnny in the pages of The Fantastic Four, while Ditko was the co-creator of Spider-Man and has drawn all of Spidey's stories to this date. And when you factor in the eternal question of who "created" Spider-Man, having Stan, Kirby and Ditko all collaborating on this tale is really quite a boon! You can see here the ruggedness that a Peter Parker by Kirby would have had. It's not bad, but we can see why Ditko was the more appropriate choice! In yet more firsts, we have here what could be argued as the first explicit team-up story. There have been a few crossovers by this point, but in all of them the guest-starring characters were given clearly lower visibility and importance - such as the Hulk appearing in Fantastic Four #13 not as an ally but the issue's actual threat; or Ant-Man appearing in FF #16 only long enough to give them some shrinking gas, leaving them to have the adventure on their own, and then popping up at the end to save their bacon. This is the first time we see equal time being paid to both characters - despite this being the Torch's "home turf" of Strange Tales, the story spends just as much time with Spidey - and is also the first Marvel appearance of the trope wherein the two heroes first fight it out (due to a simple misunderstanding, of course) before joining forces to go after the bad guy. It's only slightly less dramatic when you realize Spider-Man still had to take the ferry. 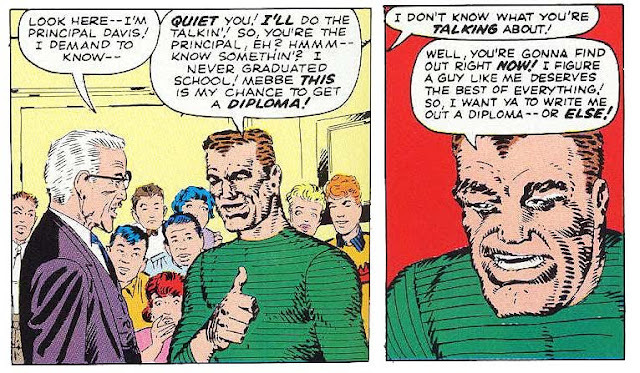 Finally, one of the joys of this seldom-reprinted issue is that it allows us to see that real beginning of the friendship that would form between teenagers Peter Parker and Johnny Storm. Spider-Man applied for FF membership back in his very first issue, and in ASM #3 he thanked the Human Torch for the inspiration and encouragement Johnny provided during a crucial moment of doubt. This is the first time they get to interact for more than a few seconds, however - and it goes badly at first, as art thief The Fox frames Spider-Man for the heist he's pulled, and the hot-headed Johnny falls for it - but by the end of the tale they've bonded, and Johnny is trading faux-gripes with Peter as easily as he would with Ben. And a welcome bonus is when the Torch agrees to meet Spidey to talk ... on the very top of the Statue of Liberty! As long-time readers will know, this would become the traditional meeting point for these two heroes, and a symbol of the friendship that would endure for years to come. Now here's an unexpected treat: The credits for this issue list the script as by one "Joe Carter" - but that's actually just a pen name used by Jerry Siegel, co-creator of Superman! The practice of using a pseudonym was much employed in the earlier decades of comics, when the rivalries between comic publishers was fierce, and the editor at one company might hold a grudge if you took work from the editor of another. (This despite the fact that they kept the page rates so terribly low that you had to take whatever work you could find, whenever you could find it.) 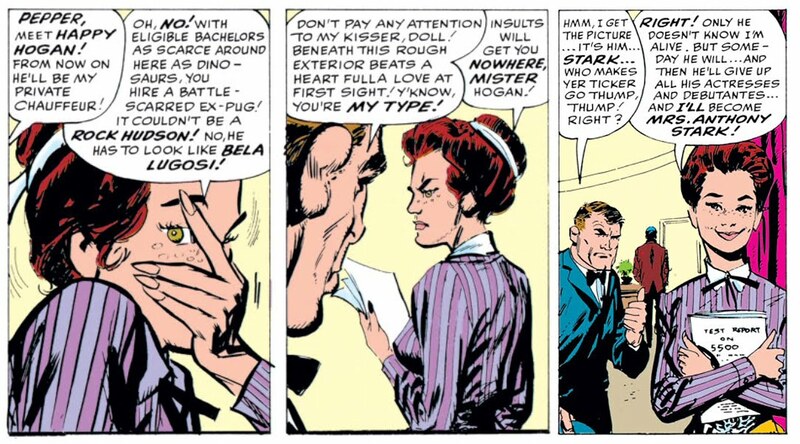 As to Siegel's efforts here, in his first Marvel job? Honestly, it's a mixed bag. The story itself has some surprises, and we get a refreshingly deeper glimpse into Johnny's head than normal. But while Siegel seems to be pretty good with character motivations, his dialogue is excruciating. Examples are aplenty, such as when Professor Lawson tries to stop The Eel and exclaims, "Can't ... hold you! A greasy mixture on your outfit renders you as slippery as the creature you're named after! ", or when Ben Grimm explains his actions so much that the word balloon alone takes up 90% of the panel, with a teeny tiny Thing head squeezed into what little space is left. 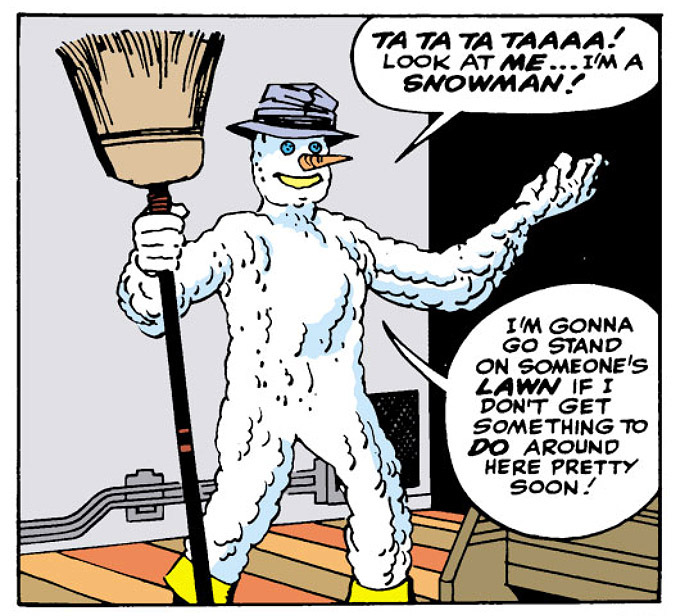 One unusual aspect to this story, however, is that it features Johnny withstanding a smear campaign by local TV commentator Ted Braddock, who claims that the Human Torch is brash, cocky, and flaunts his powers all over town, "as though he's better than normal citizens!" The thing is - we can't exactly say that Ted's wrong, as the story opened with Johnny doing just that, performing all sorts of tricks not because he was prompted to by the crowd, but specifically because he wasn't getting the accolades he'd grown accustomed to (Ted's words having already reached the masses). Braddock also accuses the Torch of "undermining our citizens' respect for courageous law officers" who have to perform their jobs without a shield of flame or the dazzle of celebrity. And while this bit of censure goes too far - right after the broadcast, the Chief of Police stops by Johnny's home to reassure him how much the force appreciates his help - this is nevertheless interesting for being an early attempt at viewing the fantasy of superhero comics through the lens of greater realism. How would such characters be embraced in the real world, and what (non-fantastic) problems might they be surprised to have? Though slamming Siegel's expository dialogue - some of the worst seen thus far - I do have to point out that in addition to the unusually skilled crafting of character motivations, his scripting also contributes toward what becomes an incredibly suspenseful story. Early on in the tale, costumed crook The Eel breaks into Professor Lawson's laboratory, intent on nabbing whatever new invention is destined to be worth a fortune. To his bad luck, what he steals turns out to be an active atomic pile, set to detonate one hour after being exposed to air! (Um. Maybe the Prof needs some oversight?) What follows is a tense race against time, as the Torch rushes to avert the disaster, and Siegel sells the suspense well; as each panel races closer to the end, we feel it. Johnny does contain the nuclear blast, but only via supreme sacrifice, and in the aftermath the town holds its breath - even Ted Braddock, who takes back his entire tirade - as they wait to see whether Johnny will come back from the brink of death. It's a foregone conclusion that he does, but that's not important; what is, instead, is how vitally the town and his teammates treat his critical condition, and the gnashing of teeth that ensues as they contemplate his loss. Such a scene, though a simple and obvious one, hasn't really been portrayed in the early Marvels to date - and it's surprising not just for how well it's pulled off, but the fact that such a heart-tugging coda would appear in, of all things, Strange Tales. Now that is one heck of a striking image! With the fourth issue of Amazing Spider-Man, Stan Lee and Steve Ditko continue their streak of rolling out new creations who will prove to be among Spidey's most classic and iconic of villains. This time out: Flint Marko, the Sandman! So it's surprising to read this first appearance of a villain so famous that he was included in the (terrible) movie Spider-Man 3 ... and find that the character doesn't really come through in his debut. Mind you, there's nothing wrong about this new creation as first presented; his powers are certainly inventive enough, and Ditko ensures that his look is creepy, compelling and with menace. But aside from those surface elements, and his occupation of choice (bank robber), we learn virtually nothing about him, or what makes him tick. Yes, such broad strokes and simple motivations are absolutely the standard in this early era of comics - but it's the fact that Marvel's early success was earned largely by doing the opposite of that, and imbuing their comic book characters with complex and relatable conflicts and histories, that makes the omission here quite so puzzling. 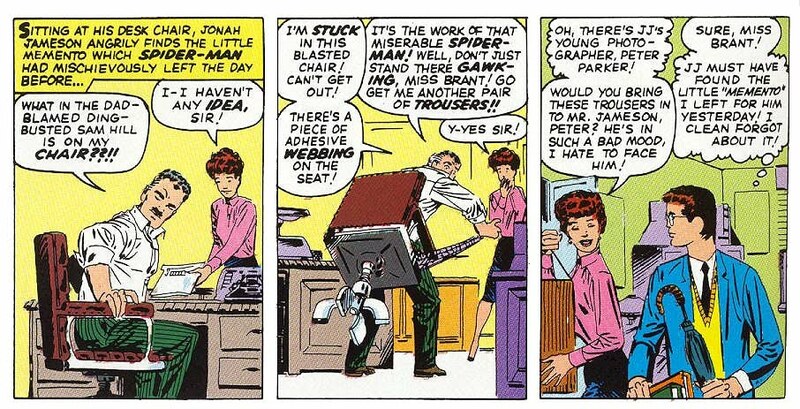 is completely oblivious to the flirting glances of Betty Brant. On the other hand, what we do learn about the Sandman's origin is intriguing, if not necessarily for the reasons intended. A few months back, we're told, Flint Marko escaped from "Island Prison" and evaded the authorities for some time before unwisely deciding to hide in an atomic testing site - where, some days later, a nuclear explosion fused the cells of his body to those of the sand beneath his feet. 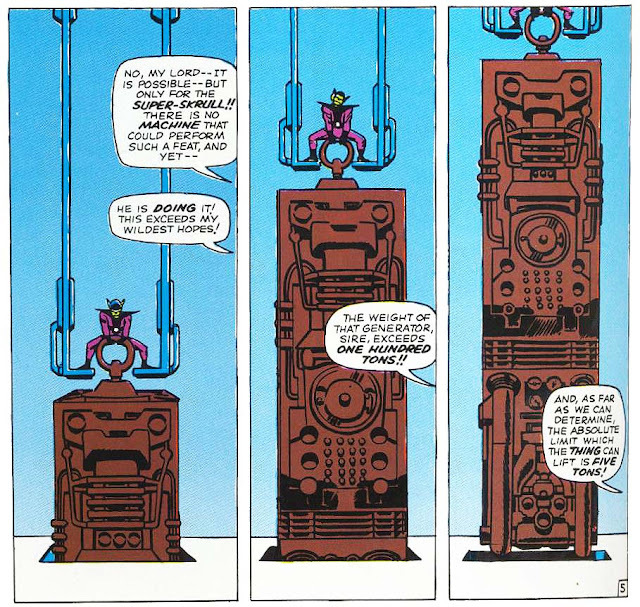 Now, I don't know about you, but the first thing that leapt to my mind was to wonder whether this site might not be the same one as from The Incredible Hulk #1. Heck, maybe it was the very same bomb! So I made it a game and laid out the facts: He's not local to the New York area like so many other villains, as Peter claims that he's "wanted by the police from Maine to Mexico!" And if we were to interpret "Island Prison" as an obvious stand-in for Alcatraz, we're just a couple of hundred miles away from the Hulk's birthplace and stomping grounds of Nevada. While it's a conclusion not explicitly intended by Stan Lee, it is interesting to note that Stan & co. have already been doing such a great job at world-building - on-the-fly, even - that the reader seems almost invited to play such mind games, predicting when and where else the various strands might connect. composes the face not in straight lines, but with a granulated look. Defeated with a vacuum cleaner. 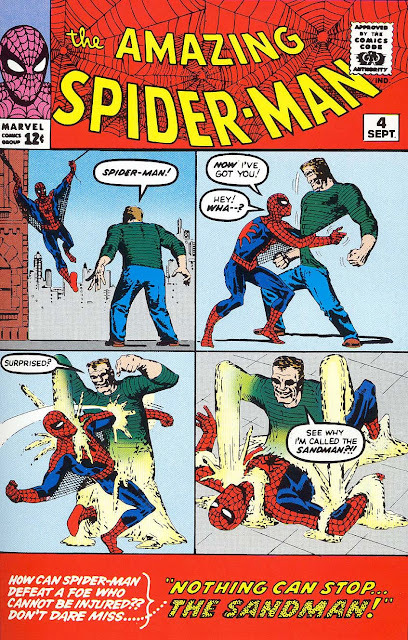 One of the more well-remembered finishes in comics! triumph, accolade and detractor - all in one. Ben Grimm is uncomfortable with this "continuity as soap opera" analogy. It's also worth taking a moment to note how Time is being handled in these stories. When Johnny talks about the FF having first fought the Skrulls "a year ago" (a year and a half, actually, but why quibble? ), the implication is clear: These stories are being told in something akin to "real time", where a month between issues is, on average, reflected by a month between stories. 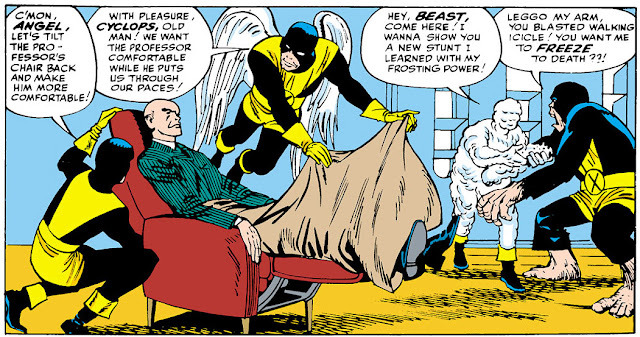 By continuing to set the comics in the perpetual now, Stan subtly increased the realism being conveyed in these stories - because when the reader thinks back to when the FF last fought the Skrulls, it was a year ago, darn it! Of course, this couldn't last, and the "sliding scale" method would soon replace it. In fact, I'm reasonably sure the only ongoing superhero title to stick to "real time" is Erik Larsen's Savage Dragon, whose title character has - over the 18 years since its initial publication - grown older, had kids, and seen those kids become young adults themselves. to show a progression through time. I'm stunned at every use. So, yes: It's the return of the Skrulls! Alien invaders are a dime a dozen in this era, yet - of all of them - these are the ones Stan & Jack chose to bring back, and who would go on to be a continuing presence in the growing Marvel Universe. Why them, we might wonder? 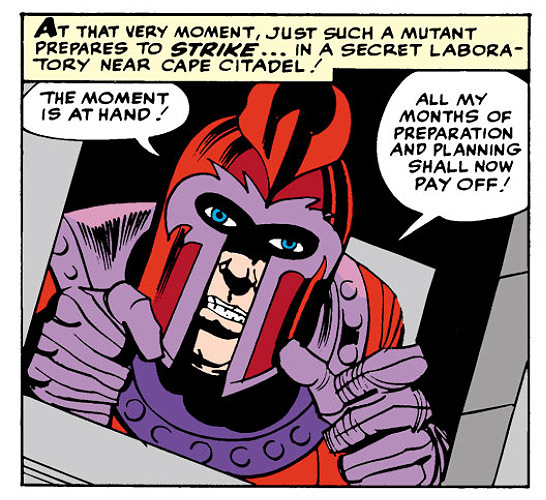 Did Kirby just have a soft spot for those green, crenellated chins? 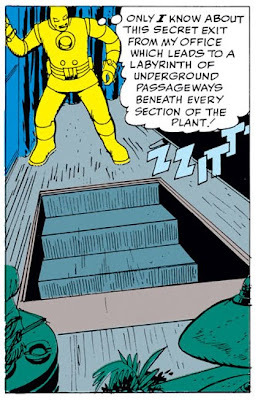 Regardless of the reason, they've learned from their previous defeat, when the Fantastic Four's powers were just crudely simulated by their alien impersonators (aside from the malleability of Reed Richards, of course). 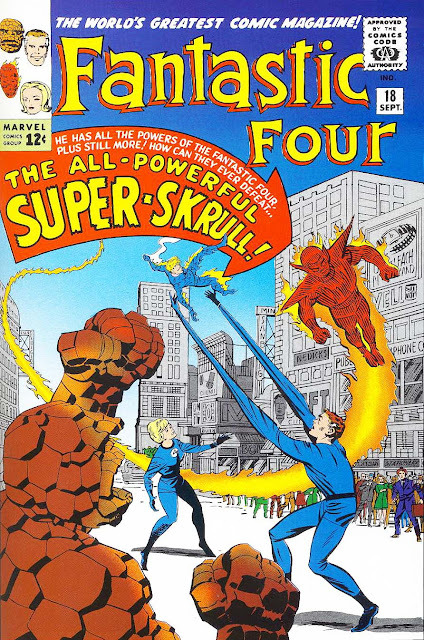 This time, their new creation, the Super-Skrull, actually has all the powers of the FF - and can use them at the same time, to boot! Regrettably, this does turn the actual story into a simple and somewhat tedious one, as we bear witness to the Super-Skrull using each of his different powers, against the same or different foes, each on its own or in different combinations. You can understand why Stan & Jack would want to take the time to fully show the threat of their new villain ... but it takes a bit longer than our patience would like. The Super-Skrull starting his publicity campaign in New York. So of course he'll kick off in Times Square! 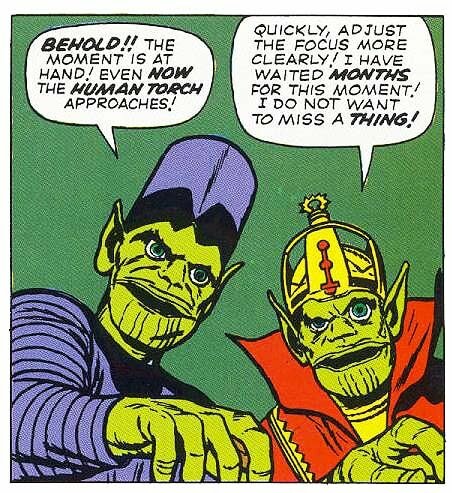 In addition to the powers mirroring that of the Fantastic Four, the Super-Skrull has one extra ability as well: that of hypnotism! Now, what the long-time reader may catch onto here is the fact that hypnotism is precisely what Reed used to defeat the Skrulls at the end of their first encounter ... but, strangely, this is never referenced or even hinted at in the dialogue itself. This kind of subtlety isn't exactly something Stan was known for - and recall the age range to which he was primarily writing - but, once realized, the parallel is unavoidable. Was this perhaps an explicit and intentional part of the plot, which Kirby then drew, but which during the dialoguing stage was simply forgot? Or was this just another case of Stan's unconscious motivations being sometimes more inspired than his deliberate ones? bringing with him the next ish of Strange Tales.